The Life Fitness X1 Go Elliptical Cross-Trainer is helping America remain physically fit. The X1’s uniquely designed elliptical drive system combined with its state-of-the-art custom workouts offer a total body workout that help users reach their goals quicker than ever. Currently available on Amazon.com, the Life Fitness X1 Go lists for as low as $1,412 for a used model and $2,199 for a new, unused machine. Life Fitness has been helping people live healthier lives for more than 40 years. It has earned the trust of thousands of people by designing and building quality and durable top-of-the-line fitness equipment that has changed the way many look at elliptical workouts. The Life Fitness X1 has plenty of features making this elliptical cross trainer an essential tool to taking steps toward a healthy lifestyle. The beauty of the X1 is that people of all sizes and shapes can get the desired body workout they desire. The attention to detail in designing a machine that is results driven has resulted in a workout where the user will burn a maximum amount of calories with a minimum amount of perceived exertion. Quiet operation. Life Fitness engineers have incorporated WhisperStride technology that allows for a quiet, fluid motion while working out. WhisperStride technology reduces the risk of injury while allowing the user to work out without disturbing others. Unique ErgoGrip stationary handlebars offer security and stability and allow you to focus on your lower body to create a targeted workout. 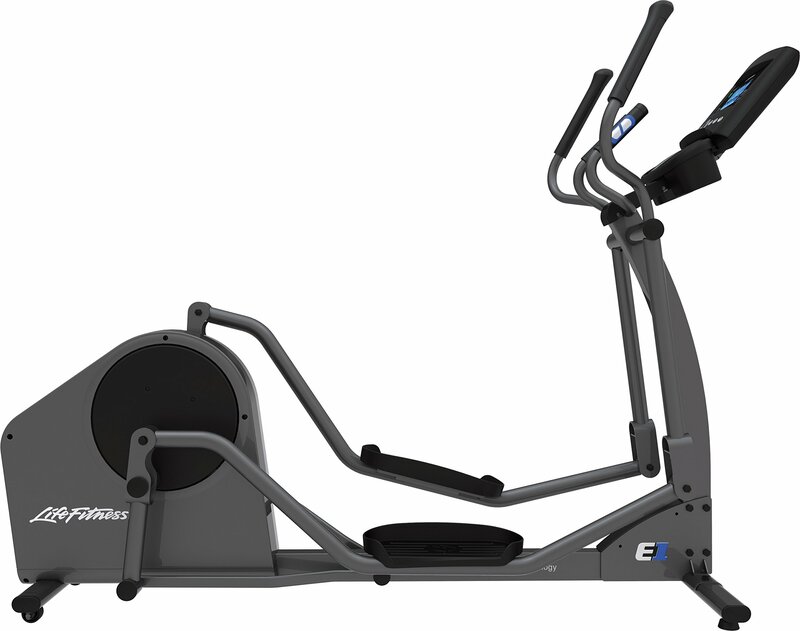 Life Fitness’ patented Link6 elliptical system sets the X1 apart from others in its class. The Link6 provides a natural, comfortable stride that belies being part of a strenuous workout. The X1 offers a wide variety of workouts from manual programming to custom workouts that target calories, distance and heart rate. This elliptical has an advanced state of the art design that allows for a very comfortable stride. Motion handlebars are easy to maneuver and feel natural. A built-in reading rack and oversize dual accessory tray lets you multitask while burning calories. The low step-up makes it easy and safe to get on and start up the X1. Comes equipped with contact heart rate hand sensors and a wireless heart rate monitoring system. The Energy Saver mode reduces energy consumption by up to 90 percent when the equipment is on but not in use. The X1 has the ability to adapt to new software as more apps become available. The Life Fitness X1 is LFconnect compatible. You can create custom workouts and follow and share results at www.lfconnect.com. While the advantages and positive features of the X1 are many, those considering purchasing the X1 should be aware of a couple of problems linked to the machine. Despite claims that the X1 is a perfect for people who come in all shapes and sizes, some taller users have said their stride is unnatural with the X1. The electronic console has been a problem for some users. The console’s digital readings might be hard to read and for those who report the issue, getting the problem resolved has turned into another issue. The level of customer service varies depending on where the machine is purchased and from whom. Some owners who have encountered issues with the console lament Life Time’s three-year warranty on parts and one year on labor. Other elliptical machines in the same class as the X1 offer up to five years on parts and three years on labor. While the Life Fitness X1 Go Elliptical Cross-Trainer might not be perfect, the advantages of owning one far outweigh the few disadvantages. There are plenty of other models of elliptical machines in the X1’s class, such as the Precor EFX, but for the price and the features, the X1 is a buy you won’t regret. Plus, there is no question that the X1 is an elliptical machine, not a stair climber with an uneven stride. Life Fitness has designed a machine that provides a total body workout with a smooth and easy operation of equipment. Life Fitness also takes into account the fluid nature of working out and allows the user plenty of flexibility to work on specific parts of the body. Adaptation to new technology and new workout regimens is definitely an advantage X1 users can boast about. The X1’s WhisperGlide technology, ErgoGrip handles and Link6 elliptical system add up to an amazing workout that will make it easier for you to reach your fitness goals.